Why is sustainability in the culinary industry important to you? It’s so important that we are taking care of our land, environment, bodies and animals. We are all tied together to create a healthy world and through food all these things are connected. How do you currently Change Menus, Change Lives in your work? I moved to Napa to take over school food here. Our program had been outsourced for 30+ years. We are now self-operated, cooking from scratch, buying better products, supporting local, etc. We have salad bars in all our schools. We only serve fresh fruits and vegetables, eliminated high fructose corn syrup, are bringing in antibiotic-free meat and chicken. 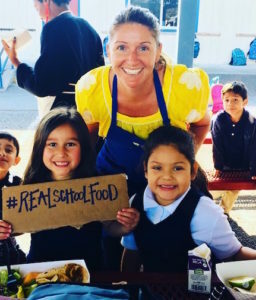 Our district has an over 50% free and reduced population and many food insecure families, and I believe that we need to take care of them at school meals so that they can be successful throughout their day and learn better. What do you feel are the main obstacles for prioritizing sustainability in school dining programs? The main obstacle is the severe costing allocations that we have to adhere to. I really only have about $1.25 per student, per meal, and with that there are five components that I need to hit in order for it to meet the USDA guidelines as a reimbursable meal. The way that I try to balance this is to seek out local farmers, growers and producers who have a shared vision and build partnerships with them. Our program features salad bars in all schools with only seasonal California-grown fruits and vegetables offered. We have brought in bulk milk machines and serve organic white 1% milk from a local dairy. This method not only keeps the cost down by buying in bulk, but has eliminated the paper cartons and allows the kids to take only what they want. We are purchasing hormone/antibiotic free beef burgers from nearby Marin County and bringing in Pacific Grenadier, once considered a “trash fish”, from the Monterey Bay for our fish tacos. What’s a future project you’re excited about? The future project here in the Napa Valley Unified School District that I’m most excited about is our new central kitchen that we will be opening late fall 2018. We are currently transforming the old Napa Armory building that has been vacant for a number of years. This new facility will house our district food service department offices, serve as our food warehouse and be the production kitchen that will service 19 elementary schools in our district. This state of the art kitchen will enable us to become more efficient in our production, allow us to add new menu items and will be great for the morale of my kitchen staff.